An invitation to tender is a really important document in construction and other project-based industries. It is the main instrument which companies in these industries use to garner interest amongst and eventually choose the vendors who will work on their projects. The black and white definition of an invitation to tender? An invitation to tender is used as a formal invitation to make an offer for the supply of goods and services. 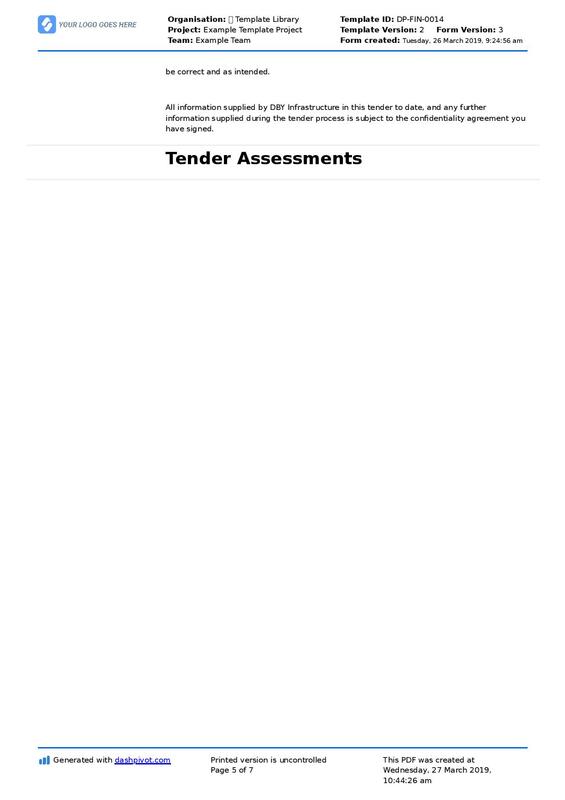 The tender assessment and decision process can be lengthy and consuming for construction companies. 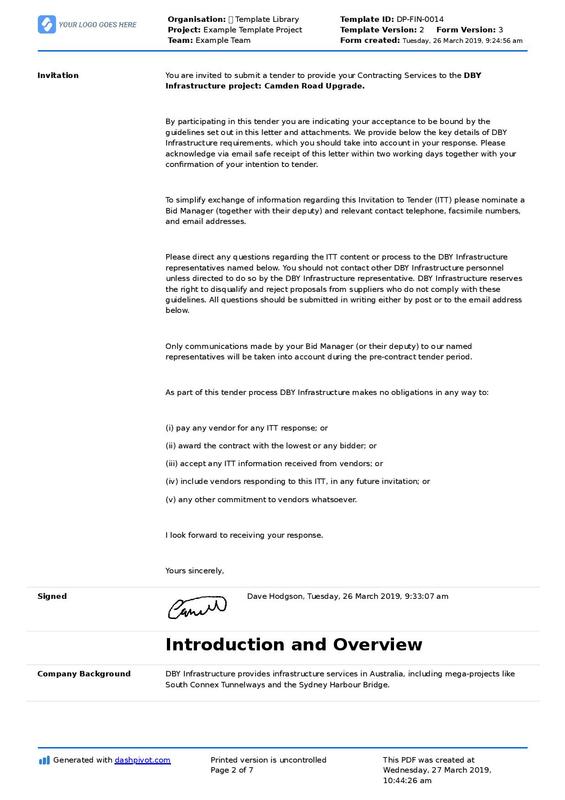 The invitation to tender (ITT) letter is one of the first steps in this 'buying' process, and is often the most exciting for the companies providing their goods and services. Many contracts in construction start with an invitation to tender letter, which is why it's so important to get your invitation to tender letter formatting and process right. The invitation to tender letter sample below outlines a basic and reliable framework which many companies use to create and issue their invitations to tender. An invitation to tender letter, as you'll see in the examples below, can vary from company to company and project to project. Some companies use the letter as the formal invite and attach the information regarding the project, while others include more project information inside of the 'letter' itself. If you are a looking for an easy and professional ITT format which you can attach more detailed information to, then a letter format like this is perfect. It's simple and does the job. If you are looking for a more comprehensive and professional way to share and package your invitation to tender letters, then look below this sample letter to the document examples. 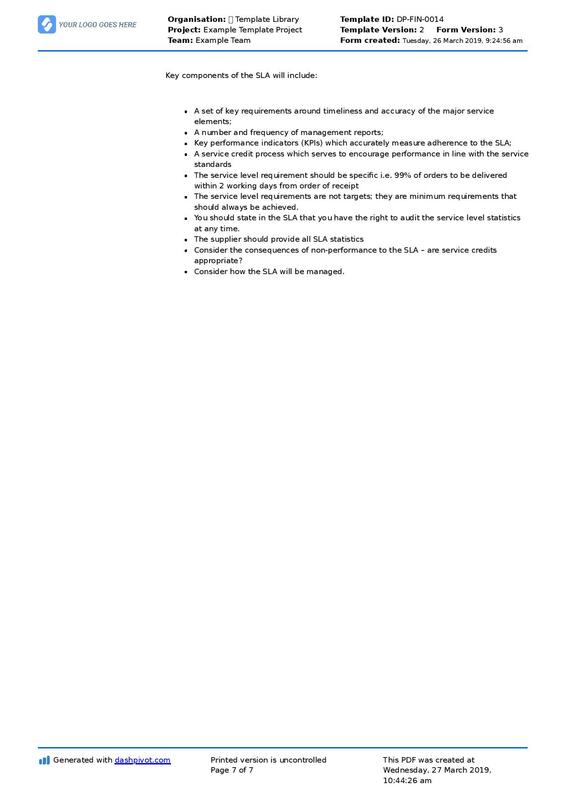 Your company is invited to tender for the above-mentioned work. 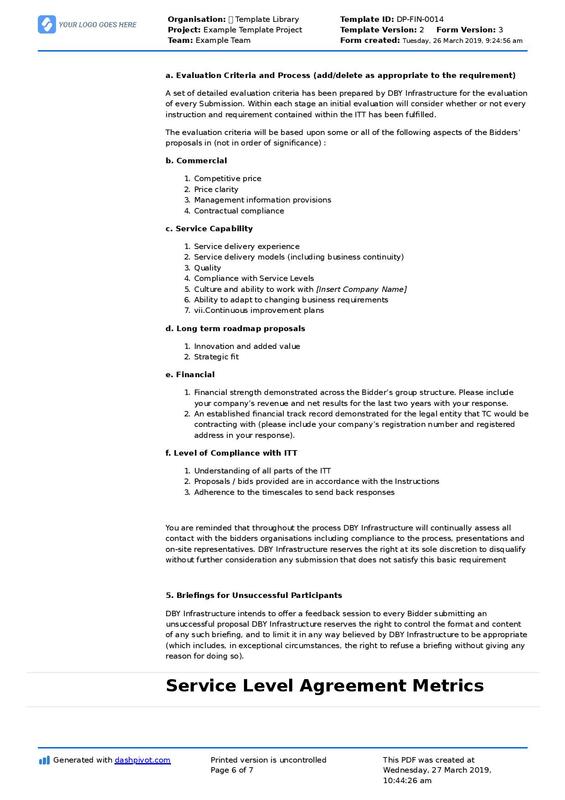 Tenders must be lodged in accordance with the Tender Conditions in the attached tender document. Any queries regarding this tender are to be referred to [Insert contact person] on [Insert contact person details]. The purpose of this invitation to tender letter example is to show you a more modern and comprehensive approach to creating, managing and then issuing an invitation to tender letter. This type of invitation to tender document works well for projects large and small. Smaller projects and companies can easily package their invitations to tender into a complete invitation to tender template, which can then be cloned or copied and adjusted for each project. Instead of having to write and send an invitation to tender letter to 4, 5 or more parties, you can simply clone a document like this, adjust as required, and then send on to as many parties as you like in a single click. In addition to saving time and admin, this type of invitation to tender enables you to include and package more information. If you hover over the invitation to tender example, you can expand the example and see the other pages. This framework comes with full sections for the company background, project information, respondent instructions and the nature of the tender assessment. This gives the vendors way more information in regards to what the project and tender process will look like, and establishes a strong impression about the project and how information will be communicated on the project moving forward. You could even combine these type of invitation to tender examples with the sample letter above, to make it an even more formal and professional outreach. The goal of your invitations to tender is to get a response and eventually suitable project quotes from suitable vendors, so the more clear and transparent you can be about the company and project - the more likely you are to get the vendors and end product which you desire. Use this invitation to tender letter framework for free. So far, we have only covered one side of the invitation to tender process, and that's the side focused on issuing the invitation to tender and owning the project i.e the asset owner and operator. On the other side of the coin, general contractors, subcontractors and suppliers obviously need to respond to the invitation to tender letter. In most cases, these companies can pretty quickly consider and weigh up the invitation to tender. 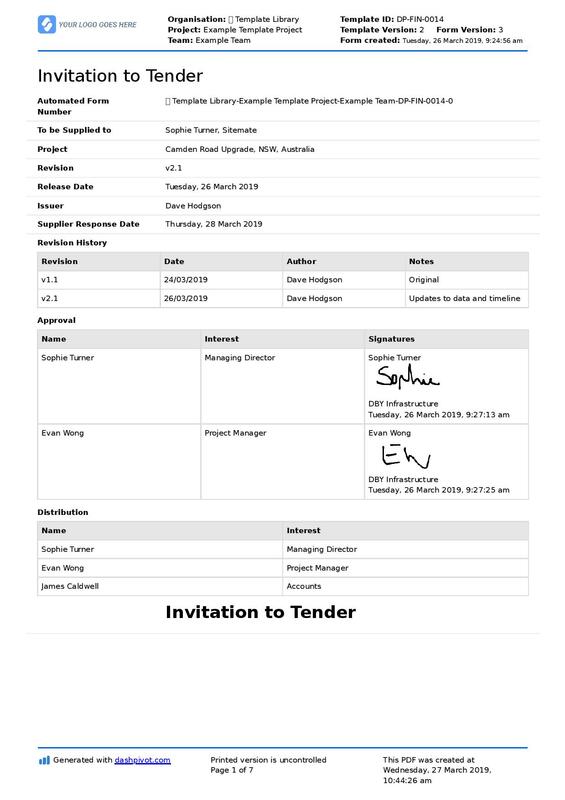 If there is no red flags and the company has adequate resources, then the company will send a reply to tender invitation letter like the sample below - and then spend their time properly assessing the project and assembling a good quote. Thank you for your request for our tender on [Insert project name]. 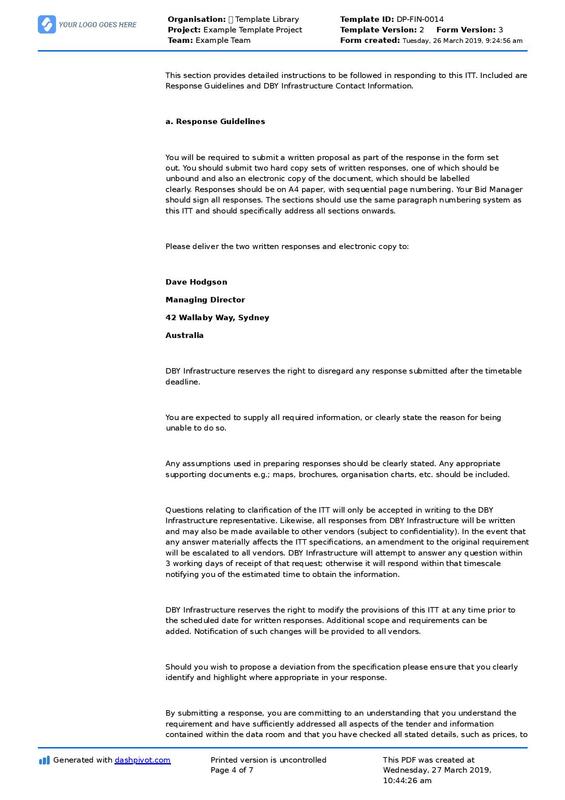 This letter is to acknowledge our receipt of said request and to advise you that we will be submitting our proposal on or before [Insert confirmation of deadline]. As you can see from the above reply to tender invitation sample letter, and as touched on above, this reply letter can be really short and concise. 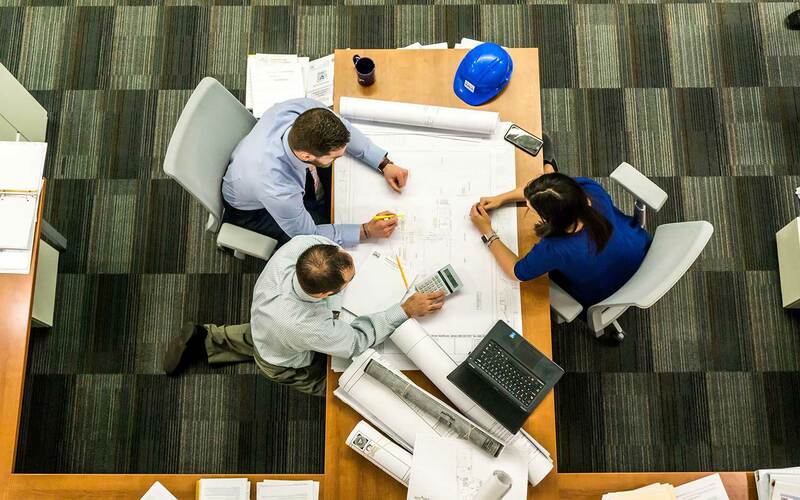 The ITT issuing party just needs an acknowledgement that you are going to submit a tender, so that they know how many vendors will be submitting tenders, and so that they have their project bases covered. 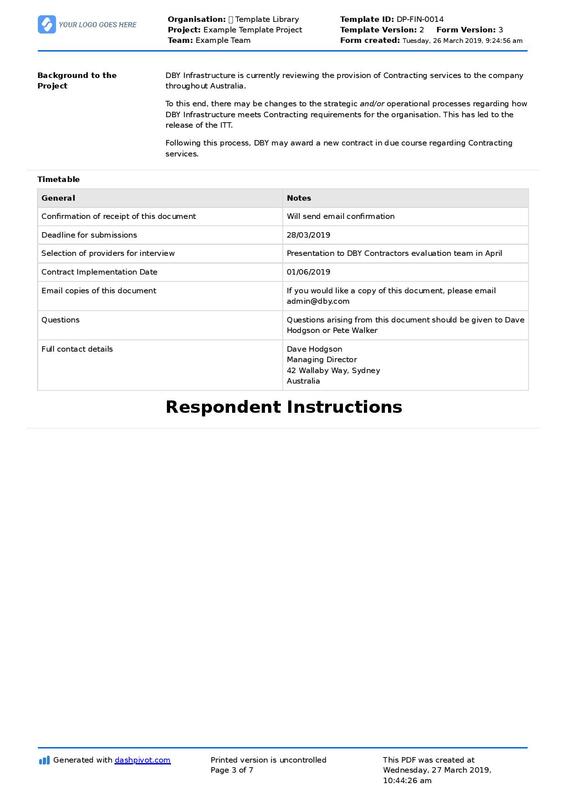 As you can see from the invitation to tender examples and sample letters above, the invitation to tender process is the easiest and most straight forward part of the tendering and procurement process. In saying that, managing ITT's across many concurrent projects and reconciling a bunch of incoming replies from contractors can be a headache. So in addition to making sure that you have a clean, comprehensive and understandable letter format or document you can rely on for communicating the invitation to tender, you also want to make sure that the entire process is managed smoothly as well. Start your projects as you mean to go in with a strong and professional invitation to tender letter. What seems like a simple part of project management can have a flow on effect on all of your project communications and outcomes.